Yesterday in his home country of Thailand, reigning WBC minimumweight champion Wanheng Menayothin made boxing history by breaking the perfect 50-0 pro record belonging to “T.B.E,” Floyd Mayweather Junior. 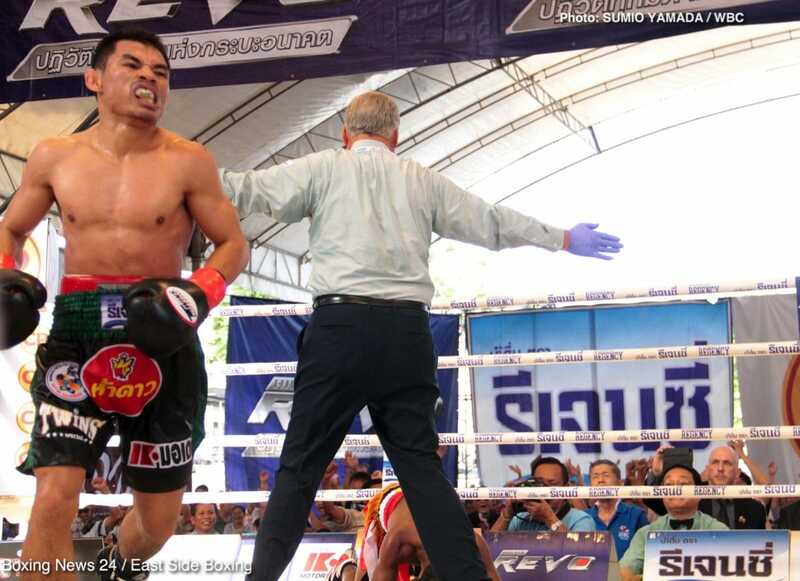 In defeating challenger Pedro Taduran by 12-round unanimous decision, the 32 year old Thai made it to a quite incredible 51-0(18). Outboxing the somewhat limited but tough and game 21 year old Taduran, a southpaw from Manila in The Philippines who has never been stopped as a pro, who fell to 12-2 with the defeat, Menayothin emerged victorious by margins of 118-110, 117-110 and 115-110. Yesterday’s win marked Meneyothin’s eleventh world title retention and the 105 pound warrior has held the title since 2014. “The Dwarf Giant,” as Menayothin is colourfully known, now has a secure place in the history books, but what might he do next? Menayothin has said that he aims to have five more fights but that he will retire if he suffers a defeat along the way to reaching an even more impressive 56-0. The knock on Menayothin is how he has boxed every single one of his fights at home, with a good number of his wins, even his title fight wins, coming over little known fighters who had poor to average records. Still, whoever you are fighting at pro level – or at any level come to that – it takes talent and ability to avoid defeat in over a half century of fights. And Menayothin, all 5’2” and 105 pounds of him, has been active, taking no less than five fights last year and two so far here in 2018. A pro since January of 2007, Menayothin (also known as Chayaphon Moonsri) has now achieved worldwide fame and notoriety. He may make it into The Hall of Fame, and Menayothin is nowhere near as great a fighter as Mayweather, or the 51-0-1 Ricardo Lopez, but the little warrior from Thailand now boasts the finest numbers in pro boxing. Can Menayothin retire without suffering a single defeat? Plenty of fans are now interested in seeing Menayothin in action. A hero in his homeland, “The Dwarf Giant” has retained his modesty, saying he hardly even thinks about his incredible pro record.